From left: Richard Jackson, Thornley & Lumb M&E; Darren Jones, Nikal; Tim Harvey, ISG; Peter Haspel, Valeo; Evan Goldszak, Quadrant Real Estate; and Ben Otter, Axis Architecture. The development partners behind a 586-bed, 14-storey student flats project in Sheffield flew from across the world to celebrate its ground breaking. It marked the first milestone for the £33 million building constructed by ISG for developer and operator Valeo. The building’s core is already complete, with work now starting on the concrete frame. It is on a former Peugeot garage next to the Waitrose supermarket on Ecclesall Road. 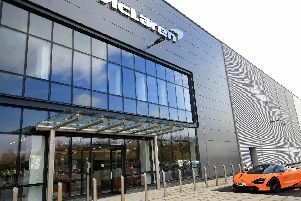 The project, which is due to complete in summer next year, is Valeo’s first in the UK. It is close to a 784-bed complex of student and private flats on the former Gordon Lamb car dealership in Summerfield Street, near Ecclesall Road, which is underway. A third nearby scheme, by Hallminster, is due to start later this year. It will create 144 private apartments, 190 student flats and five ground-floor shops on Ecclesall Road and Pomona Street. The scheme includes a ninth-floor ‘club lounge’ complete with balcony overlooking the city, as well as lounge and study spaces, a café, private dining areas, TV room and gym. Accommodation is configured around four, five and six-bed clusters, as well as a number of studio apartments.